I've loved this Twin Color polish since the first coat: it's a shimmer (yay), very easy to apply and opaque in two coats. Color change is not as dramatic as the ones I tried before, it switches from magenta to dark red-violet, but both colors are really intense and rich, with a wonderful glowing finish. Pure love! 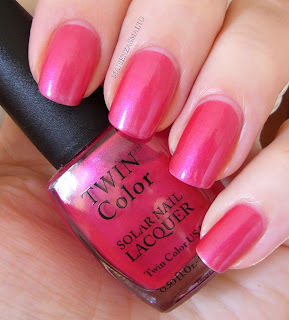 I so hope that new collection from Twin Color will contain a lot of colors with a similar finish! Ho amato da subito questo smalto della Twin Color, confesso! E' uno shimmer (evviva) che si stende a meraviglia ed è coprente in due mani. Il cambiamento cromatico non è radicale come gli altri, visto che passa dal magenta al viola caldo (comunque due colori ben diversi) ma l'intensità del colore e la finitura sono meravigliose, secondo me. Spero tanto che nella prossima collezione siano tutti così!! !